All Processed Class 1 kegs have been cleaned, sanitized, de-labeled, and pressure tested prior to shipping. Reconditioned kegs come in varying conditions and configurations. They are “used” by definition and likely are scratched, dented, and have keg-to-keg variations. Class 1 is a dual rubber handle premium reconditioned keg. A Cornelius keg is a stainless steel cylinder which can hold a maximum of 130 PSI. There are three openings in the keg: a large central hole which, by its design, can only beopened when the keg is not pressurized, and two ports with valves which are only opened when a hose with an appropriate fitting is attached to them. The central hole is used for fillingand cleaning the keg, while the two ports are used to dispense the drink. Two metal tubes are attached to the ports on the inside of the keg.The "gas-in" port has a short tube, not reaching the fluid.The "liquid-out" port has a long tube which reaches to the bottom of the keg.When pressurized gas (usually Co2 which carbonates beverages and Nitrogen for non carbonated) is forced intothe "gas-in" port, it pushes the drink from the bottom of the keg, out of the "liquid-out" port, to a tap or dispenser of choice. Cornelius style (or Corny) kegs were used by the soda bottlers to deliver and dispense soda syrup. When the industry moved to BIB (Bag In Box) systems, the remaining kegs were used todeliver and dispense pre-mix soda - the type of soda sold from small trailers & at remote events. But all used kegs sold today have been retired and are now in widespread use privately andcommercially.Pin-lock kegs, also known as Coke kegs, were used by the Coca-Cola Company. 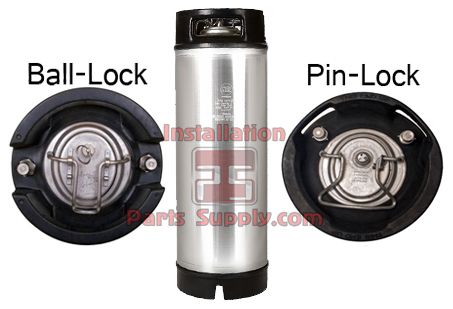 These kegs use pin-lock type disconnects to connect & disconnect the gas and liquid lines. Pin-lockdisconnects lock on with a twist of the collar.Ball Lock kegs, also known as Pepsi kegs, were used by everyone else (aka General Beverage). 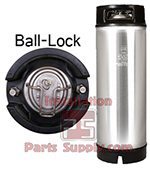 These kegs use ball lock type disconnects to connect & disconnect the gas and liquid lines.Ball lock disconnects lock on by raising & then releasing a collar. They connect just like an air line fitting connects. New Ball Lock kegs are being manufactured in China, India & Italy.Quality new kegs should last a lifetime of brewing and are an excellent long term investment.